Codesearch is vital for any tech organization that operates at a large scale, and LinkedIn depends heavily on it. Engineers at LinkedIn use codesearch frequently to see how certain APIs are being used, how configurations of certain services look, how some of the classes/methods/schema/etc. are defined, and more. Codesearch helps our engineers navigate through source code without needing the code to be checked out on their local machine. But besides the above capabilities, we wanted our codesearch tool to be able to do even more. We wanted to have a system that understands the LinkedIn codebase so that it can empower our engineers to find what they are looking for with fewer searches and in less time. We also wanted to give our engineers the same look and feel that they get from an Integrated Development Environment (IDE). Be integratable with our IDE and Command Line Interface (CLI). To meet these needs, we designed JARVIS, a search system based on client-service architecture, in 2016. JARVIS fits all of our requirements listed above and works with many clients, including web, IDE, and CLI. In this blog post, we’ll discuss how we have implemented our backend search service, some of the challenges we’ve faced, and how we have solved them. Like any other search service, codesearch also needs to accomplish three important tasks: indexing, querying, and relevance. We used Galene as the platform to build JARVIS because it helps us manage search clusters and gives us control over indexing, retrieval, and relevance. Galene fits nicely with solving our three major tasks of indexing, querying, and relevance. When we started building our services, we used to do metadata extraction on the same machine that crawled our repositories to fetch source code. Doing this was very slow and it was prohibiting us from adding any more complicated metadata extraction processes. This slowness was also hampering our ability to re-create the dump when we needed to rebuild the base index. To overcome this limitation, we moved the metadata extraction process to Hadoop. We were able to scale our metadata extraction for a lot of new use cases very easily. We parallelized the metadata extraction on Hadoop by splitting whole data into chunks and assigning one chunk to a mapper. This helped the whole base index build flow to be completed in less than 2.5 hours. Having search support over metadata helps our users narrow down the results very quickly. For creating links for references (class usage or function usage) that users can click on to go to the definitions, we must first know whether clicking on a link will land on a definition or not. We create links only for those references which we know are resolved. By resolved, we mean we have the source code that defines that reference and hence, if you click on the link, we can open that file. As a result, we don’t create such navigational links for references that are defined in some third-party library. Currently, we do reference resolution for Java or Java-like files. By “Java-like,” we mean instances where usage patterns are the same as in Java, e.g., Avro, Pegasus, and Java class usages in Spring files. Reference resolution is a very complicated process, as it requires whole state of the world. We need the complete linkage graph for resolution. One could maintain a system which contains the metadata for definitions that can be queried. This type of system could be used at query time while serving results to users, but we would need to call this new system to check if any of the function/class usages in the file that is being returned could be resolved. Maintaining such a stateful system would be a nightmare and could also potentially impact the latencies. So, we decided to take the Hadoop route again. We have a Hadoop flow that works on the definitions in Java, Avro, Pegasus, and Scala files and on usages in Java, Avro, Pegasus, and Spring files. It does some map-reduce magic against these two data sets and produces the information about all resolved class-usages and function-usages in a file. 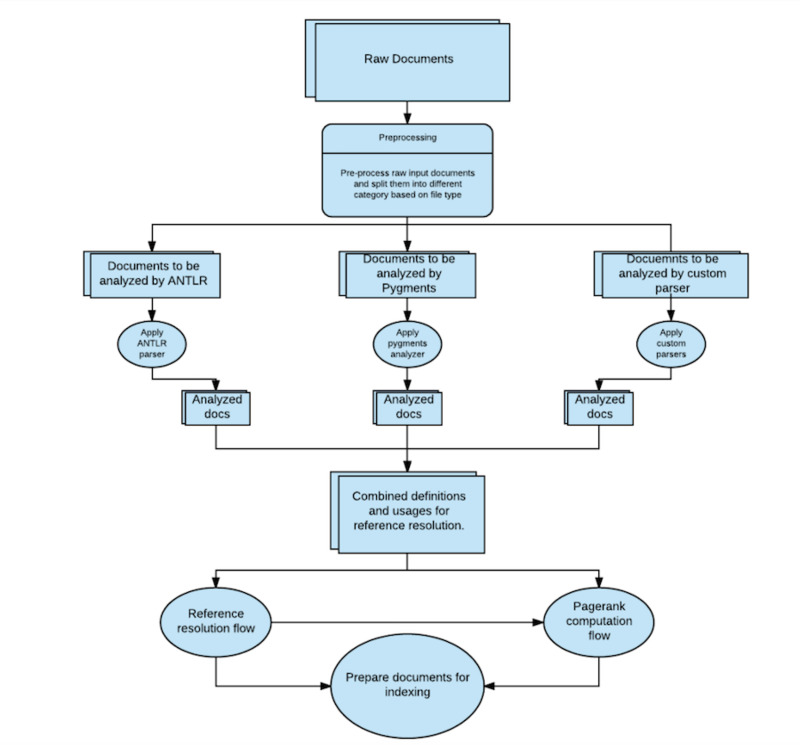 Because a resolved reference packs all the information it needs to arrive at the definition, at runtime, a document/file in our index contains all the information that it needs for decoration. Indexing is the most important part of building a search service because it sets up the foundation of building a search system. For JARVIS, we created a Galene index that has a Lucene index at its core. Indexing necessarily means building a document of fields and marking a subset of fields as inverted index fields and, similarly, a subset of fields as forward index fields. Fields that are part of the inverted index field set are the ones against which a search can be performed, while forward index fields are used for relevance and decoration of the document that gets returned for a query. Fields in an inverted index can be thought of as an index for a term, containing all of the documents where that term occurs. We use this “index” to find matching documents for query terms. Forward index fields are kept as-is; each document that gets returned as a match for an input query contains value for forward index fields, which we use in scoring for ranking and for decorating in frontend. Search matches for any keyword as substring. Search matches for a keyword in a given case (as given in the query) inside content of the file. Search matches for full word—basically if they want to avoid proper substring matches within a word. Search matches for a phrase inside the content of a file; phrase matches should not span across multiple lines. Omit a few characters (from beginning or from end or from in-between) from the search keyword if needed. Basically, *x OR x* OR x*y type of query, where x and y are a continuous sequence of non-whitespace characters. Trigram Analyzer: Every continuous sequence of three non-whitespace characters is a token. Unigram Analyzer: Every non-whitespace character is a token. Substring Analyzer: Breaks the sentence at word boundaries (typically non-alphanumeric characters) and then produces all substrings as tokens. Trigram and Unigram Analyzers also manipulate positional offset of tokens intelligently, which we leverage while searching a document from the index. This helps us do phrase query and proximity query. Now let’s concentrate on how we go about our querying and relevance. Before we go deep into that, here is a diagram outlining the various pieces involved. We also support * queries, which can be used to search keywords by skipping a few characters in between. For example, hello*world means “find those files which contain hello followed by world, and there could be zero or more characters in between”. We ensure that phrase matches happen in one line by manipulating token positions during indexing when a line changes. For * queries (sometimes also referred to as “proximity queries”), we also ensure single line matches; again, this is possible because token position for the next token change by a predefined number, and while creating a proximity query, we ensure that our proximity is less than that number. Currently, for an x*y type of query, we are able to find matches with a skip of up to 20 characters in between. But this is a configurable number, and we can easily increase or decrease it if we see a need. We use Boolean query syntax, which supports OR, AND, and NOT as the basic operators. We also have support for context, which can be built by opening and closing a bracket. Few characters have an important meaning when building a Boolean query, but these include colon [:] and open/close bracket [(/)]. But a user might want to search for these special characters as well; to make such a query possible, we also support an escape character function. One can escape a character by using backslash [\]. A user can escape any character—it doesn’t necessarily need to be a special character. 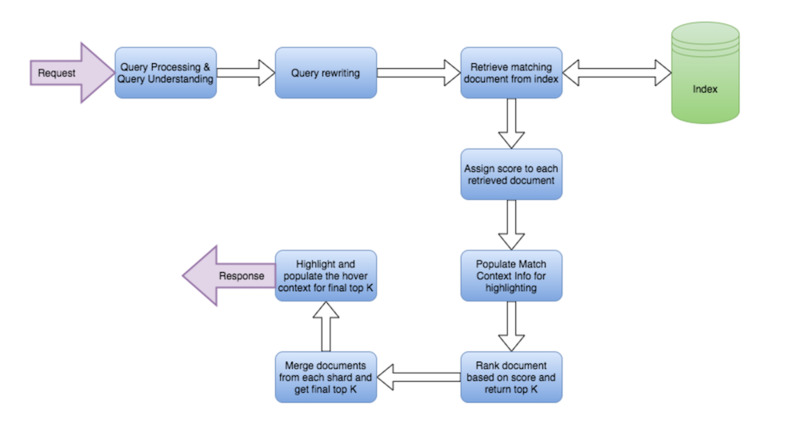 Our backend query-processing engine cleans up the query before forming a Galene query for retrieval; for this reason, escaping doesn’t do any harm. We have exposed various constructs to give the user control, which they can use to restrict searches. There are many filters available, such as import, superclass, method, functionusage, path, code, case, etc. Case is a special filter our users use to do case-sensitive search. 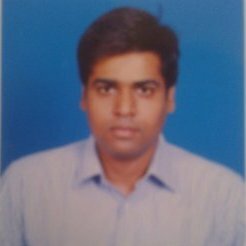 This ensures that a given keyword is matching exactly in the same case as given by user. A raw query means that the user has not provided a filter for a keyword. In this case, we try to match the provided keyword in at least one of the fields. One exception here is a multiword phrase query—these queries are supported only in the code/content of the file. When doing query processing, if we see there are such phrases given without any filter, we fill scope the search for that phrase in the code alone. A single-word phrase is treated as a standard word; hence, it will be searched in all scope and will be deemed as a match if the keyword is matching in at least one scope. We support typeahead/autocomplete on all fields except for code and case. Typeahead helps the user select the keyword that they are looking for without having to type the entire thing. Our typeahead is context-aware—it takes care of the query entered so far by the user. Relevance is a very important piece for any search system, and our codesearch is no exception. It is very important to show files at the top that users are most likely to open. Relevance for us involves assigning a score to every retrieved document, ranking them based on this score, and then returning the top K results. Score assignment is the most critical part for our relevance. We have multiple types of features, and the final score is a linear combination of scores for each feature. This is a very important component of our score. It helps us keep the final result as topical as we can. A match in each field incurs a boost, and the amount of boost a match receives depends on the importance of the field. We have different weights for different fields. We also have a Hadoop flow to assign scores based on the number of inward and outward edges. We compute this score at both a file- and a project-level to determine its importance. For a Java file, we take the imports and construct the dependency graph from this file to all the import class files. Similarly, for a project, a dependency graph is constructed based on the dependency information in its build files. Hadoop flow uses PageRank implementation from Jung to compute these scores. Above flow is run on these graphs in two ways. First, it is run with the edges in the dependency graph from a dependant node to its dependency node. The scores computed in this phase are called “authority scores,” where nodes having higher scores means that they are source files/libraries, etc. For example, a source file would be at a higher score compared to its test file and, similarly, a library would be at a higher score compared to its dependencies. The intuition behind computing hub scores is that nodes (files/projects) where the integration happens (that is, they refer a lot of files/libraries) will have a higher score compared to others. We take a weighted sum of these scores, with a higher weight for authority scores, to compute the final importance score for a file. We try to interpret the query, and if there is a match for query interpretation in the retrieved documents, we try to boost its rank by increasing its score. This we use to demote files that are too big or too small. Having a tool like JARVIS gives a big operational boost to an engineering organization. Today, code search is being used by Devs, SREs, and Ops alike—it has become the defacto way of finding code at LinkedIn. JARVIS is able to scale horizontally with little friction, which helped us onboard various types of code repositories with ease. It also supports nearline ingestion, meaning that after the code is committed, it will be available for searching in nearline fashion. Building JARVIS at LinkedIn gave us a taste of problems which are not commonly seen in other search systems. For example, tokenization for us is completely different and much more sophisticated than many other search systems, because the expectation from the query here is vastly different. It also gave us the opportunity to showcase how Galene can empower such a search system. JARVIS is the result of collaborative efforts from Bangalore Search, Bangalore Tools, and the Bangalore Search SRE teams. We would like to thank Chandramouli Mahadevan, and Abhijit Belapurkar for their guidance and support; Manoj K. Sure, Shubham Agarwal, Manoj A. Bode, Akhil Thatipamula, Sachin Hosmani, and Mansi Gupta and all the interns for their contribution toward search backend and frontend; Prince Valluri and Naman Jain for building the data pipeline; Binish Rathnapalan and Gaurav Gupta for helping us do timely release; and Sanjay Singh for QA support, which helped us make our code more robust. Lastly, we would like to thank Galene team as well, this would not have been possible without their platform support.